David Jolly vs. Charlie Crist? 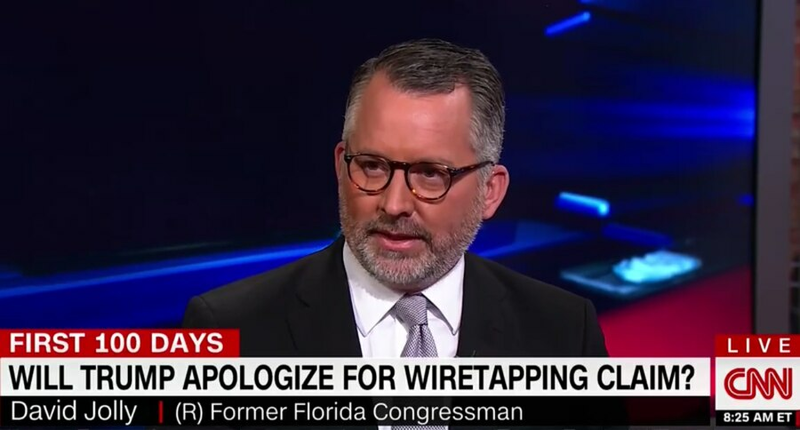 David Jolly, a former Pinellas congressman and regular guest on political talk shows, is seeking protection from stalking by a man arrested on a charge of making threats against him. This won't shock a lot of people who have seen former U.S. Rep. David Jolly, R-Belleair Bluffs, on MSNBC and CNN all the time criticizing President Donald Trump, but he has left the Republican Party. He and wife Laura quietly registered under no-party affiliation weeks ago, Jolly said, spurred in large part by the pending birth of a daughter for whom they wanted to set an example and not be part of of the Trump party. "It's also just a personal rejection of partisanship. It's a very comfortable place for us to be," said Jolly, who had initially vowed to stay in the GOP and try to help steer it back to traditional conservatism. Jolly, 45, is a life-long Republican who served in Congress from 2014 to 2017 following the death of his mentor and former boss, Rep. C.W. "Bill" Young. The former lobbyist was widely seen as an underdog running against Democrat Alex Sink in a special election in 2014, and won. He campaigned as a staunch opponent of the Affordable Care Act and abortion rights, but in congress quickly developed the reputation of as moderate congressman interested in bipartisanship. After redistricting turned his swing district into a strongly Democratic district, Jolly ran for U.S. Senate in 2016 but dropped out after incumbent Marco Rubio decided to seek a second term. Then he ran for re-election to the House, losing to Republican-turned-Democrat Crist in 2016. Since Trump's election, Jolly has infuriated many Republican former supporters for his relentless criticism of President Trump as an unpaid political analyst on MSNBC and CNN. He calls Trump "an embarrassment," and a threat to American principles. Earlier this year, he said he hoped Democrats win a majority of the U.S. House to provide a stronger check on the president. Leaving the GOP, by the way, also would make it easier for Jolly to run in his old south Pinellas County congressional district, which was re-drawn to lean strongly Democratic. It's an intriguing thought, two former self-described conservative Republicans, Charlie Crist and Jolly, running against each other. "I anticipate at some point in the future my name will be on the ballot, but I don't know when that is or what office," Jolly said. Jolly said he will be actively involved in the 2020 presidential race. While he initially hoped a strong Republican would challenge Trump in a primary, he now is optimistic that an strong non-partisan challenger could emerge, such as former Starbucks CEO Howard Schultz or former New York Mayor Michael Bloomberg.